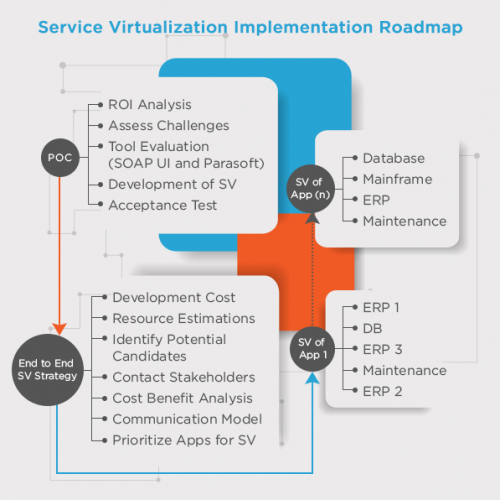 HOW CAN WE HELP YOU WITH SERVICE VIRTUALIZATION? Being an early adopter of Service Virtualization with a dedicated Center of Excellence focused on developing technical assets and building best practices, Cigniti’s service virtualization practice enables organizations to rapidly simulate and easily manage test environments to bring high-quality software to the market faster and at significantly lower costs. With rich expertise in Service Virtualization tools such as CA LISA, IBM Green Hat, HP Service Virtualization, Tricentis, Soap UI, Parasoft Virtualize, as well as proprietary solutions and industry specific jumpstart kits, we offer Enterprise-wide Service Virtualization Adoption Strategy after detailed Service Virtualization Assessment followed by Planning and Solutions. We assist you in Virtualization Tool Feasibility & ROI Analysis and also deliver Virtual Services Development and Maintenance. Service Virtualization is being widely adopted by enterprises worldwide because of the compelling benefits it offers. And Cigniti’s Service Virtualization testing plays a vital role in three major ways. 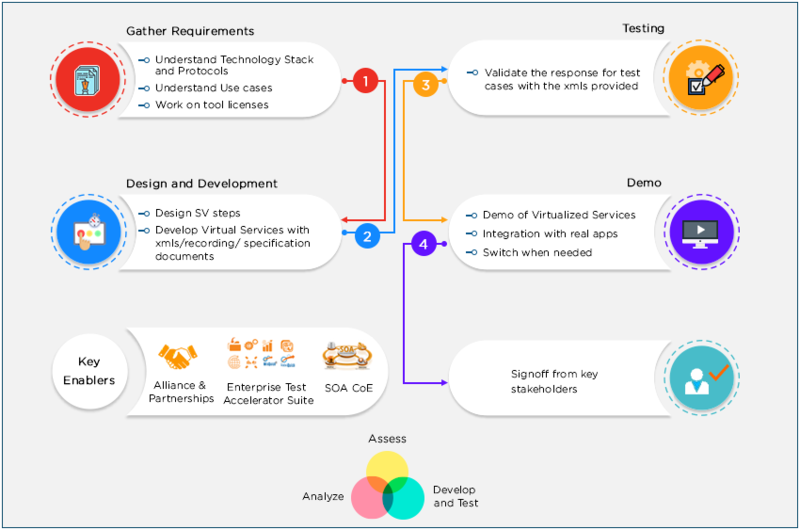 A planned and methodological approach to service virtualization testing significantly reduces test environment configuration time, simplifies test environment access, removes the bottleneck of test environment setup and ensures accelerates test cycles due to the elimination of interface dependencies. We provide a complete test environment with a 24/7 access which brings you the flexibility of a platform for extending test scenarios, coverage and more. In addition, Cigniti’s QA teams perform API tests to verify and validate the functionality and behavior of interfaces through automated request generations and then verifying corresponding published responses. Being experts in Service virtualization testing, we test your applications faster, enable faster integration and release. And in fact, our service virtualization validation services helps in load testing of applications via multiple simulated connections, or performance testing of an application via simulated connections. Implementing Service Virtualization in any-sized organization is a herculean task ridden with issues. However, most of these issues can be resolved by a well-defined virtualization implementation strategy & approach. Cigniti’s Service Virtualization implementation approach starts with analysis of the IT landscape within your organization & identifying potential virtualization targets, followed by diligent analysis of components to be virtualized. Subsequently, implementation of the virtualization strategy is done by choosing the right set of tools followed by deployment and rigorous testing of the virtual services. An overview of our implementation approach is depicted in the adjacent diagram. Our expertise in developing detailed skeleton service models that address environment and availability challenges, developing generic service images and deploying virtual service components that meet the request/response requirements makes us stand out. We also design of the service container architecture for high availability and rapid service provisioning across the enterprise. A typical implementation roadmap for service virtualization is as shown in the adjacent diagram. Cigniti will conduct a Proof of Concept (POC) which will include ROI analysis after due assessment of the challenges, due diligence and evaluation of the tools to be used in the process. 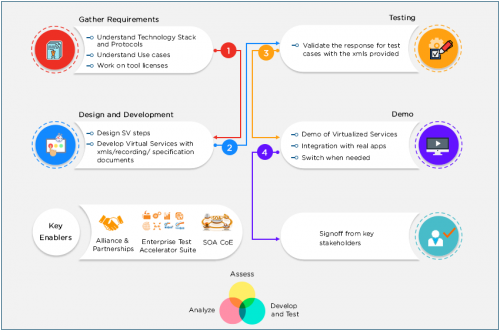 It will proceed with the development of service virtualization and acceptance of the testing approach. Subsequently, Cigniti will formulate an end-to-end service development strategy, and then build the stubs to generate the simulated service layers for the applications. The virtual services/assets can be reused across applications/BUs resulting in the reduction of development effort. All this will be achieved after doing a cost/benefit analysis and finalizing your business priorities in discussion with key stakeholders in your organization. How can Network Virtualization Help Boost Software Testing?